Capt. 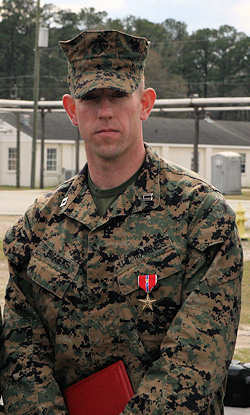 Joshua Biggers, executive officer of the Infantry Training Battalion, School of Infantry - East, stands after receiving the Bronze Star Medal with V following his award ceremony aboard Camp Geiger, March 11, 2011. MARINE CORPS BASE CAMP LEJEUNE, N.C. (March 21, 2011) -- For heroic service that spanned over the period of six months of combat operations in Marjah, Afghanistan, Capt. Joshua Biggers, executive officer of the Infantry Training Battalion, School of Infantry – East, was awarded the Bronze Star Medal with Combat V during a ceremony aboard Camp Geiger, March 11. While serving as the commanding officer of Company K, 3rd Battalion, 6th Marine Regiment, Regimental Combat Team 7, 1st Marine Division (Forward), Biggers' actions from Jan. 3 to July 2 in seizing Marine Expeditionary Brigade-Afghanistan Objective 3 during Operation Moshtarak proved instrumental in the Marines' overall victory. During the six-month operation, Biggers constantly and bravely exposed himself to enemy fire to reach key points of battle, rallying his men and directing fields of fire. While pinned down by enemy machine-gun fire, Feb. 15, Biggers simultaneously coordinated the evacuation of wounded Marines, the neutralization of multiple enemy positions utilizing air support and the maneuvers of his assault element. For these actions as well as his continuing leadership and ensuring the mission was successful, Biggers was lauded with the award which Rule hung onto his uniform amid a formation of ITB students. As the Marines in formation returned to their training and the guests of honor said their good-byes, one has to wonder what goes through the head of someone who rushes into battle without hesitation.